So you want to have a litter of puppies AND work outside the home? Does it work out? In one poll 40% of respondents said yes, and 60% said no. In another poll, only 10% said yes. It depends on the dam, the breed, and if there are any complications involved. Sometimes taking care of a litter is very time-consuming and costly. Certain issues require round-the-clock care and can get out of hand if one is not there to tend to them. After-hours vet care is sometimes double the price of daytime care. If you are going to breed and work, seriously consider if you have the time to properly care for the pups and dam. Below are a couple scenarios that people have reported coming home to. "I came home to my dead dam that tried to deliver pups while I was at work, we were so devastated. Apparently she could not get the first puppy out, and I now know from reading up on it, she had a stuck puppy. Had I been home, I would have been able to take her to a vet and save her." "My dam had a Caesarian after-hours and cost me DOUBLE than if I had been able to come in before 5:00 p.m. But I had to work. In fact everything I have had to use the vet for has been after hours and double the price." "My dam had a Caesarian, and I left her to go to work the next day and she killed the puppies. I didn't know how common this was. We were shocked, and thought dogs just naturally knew what to do." "My dam had a Caesarian, and I left her for two hours, and she tore out her stitches. She didn't make it, and I had to hand feed all the puppies. When I came home, her insides were hanging out." "When the pups were 12 days old, my dam got mastitis and it was REALLY bad. Her temp was very high, and she was lethargic. The vet put her on IV and extracted a lot of pus. I had a huge after-hours vet bill, and I am hand feeding the litter." "Day 14, my dam now has full-blown mastitis, and had to have a mastectomy. $1000 surgery after-hours. I am up all night, feeding puppies... with NO SLEEP... Some people think it is easy, and that they will make a lot of money. Realistically that is not the case. I am up all night, off to work in the morning, home at lunch, and have had to hire someone to come in midday." "My puppies had diarrhea, and two have died. I wish I didn't have to go to work as I am afraid I may lose them all. I have read about this fading puppy syndrome. They are two weeks old." "I had a litter of puppies last year, and worked. It was so easy that we decided to do it again. This time, things didn't go so well. She had her puppies while I was at work and of six puppies, only three survived. The next day when I came home from work another had died. We had two puppies, but it was not at all like the first litter. It seemed everything went wrong." 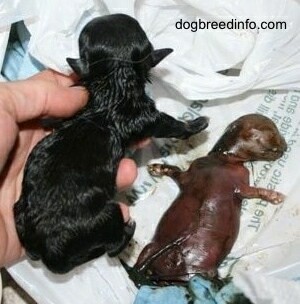 "My dog had a full-term normal litter, but one of the puppies came out dead. Neither I nor my vet know why. 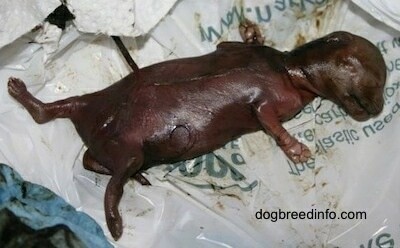 It had looked like the pup died some time ago and was wrapped up tight and sealed in a placenta. I am so glad I was home to monitor my pups being born. If I had not been home the dam would have most likely ate this puppy, making her sick, because of her instinct to keep the box clean. At the very least she would have ate the toxic placenta and licked at this puppy trying to revive it and would have ingested parts of it. 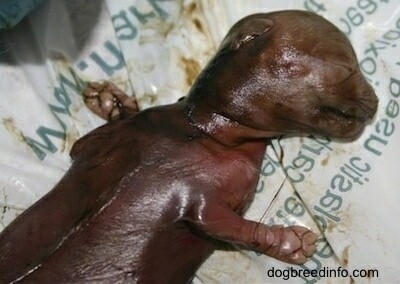 It is very important to pay attention because this pup looked like a placenta when it came out." If you plan on breeding your dog and work a full-time job please seriously consider if this is a challenge you are willing to take on. When you are not there to watch the puppies, things can go wrong. We have so domesticated these dogs over the years, they really rely on us.